Hi there. It's Friday, it's the end of the week and it's the Stamp Man Challenge - woooo. This week it is Sarah who is hosting and her theme is 'Oriental'. Now this is one type of card I have never tried before - so please be kind to me as this is a first for me. I stamped my own background paper, stamped and embossed the flower vase and cut out. I also stamped and cut out the flowers to put in it and I added Promarker colour and Sakura glitter pen. 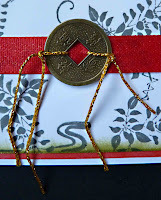 I stitched the coin to the red ribbon with some gold thread then tied it to the sides. I think this has an oriental feel to it, and I did go and research the colours and designs to try out. I have some oriental stamps, but they haven't been used before, so maybe now they will see more light of day. Have fun with the theme and be thinking about our next challenge as well, which will be 'Hearts'. Have a great Friday and an enjoyable weekend. Thanks for your lovely comments, it's great to be part of the team, you are all so inspirational. If this is really your first Oriental then I'm impressed, it's just beautiful. I love the background and the little coin detail is perfect. 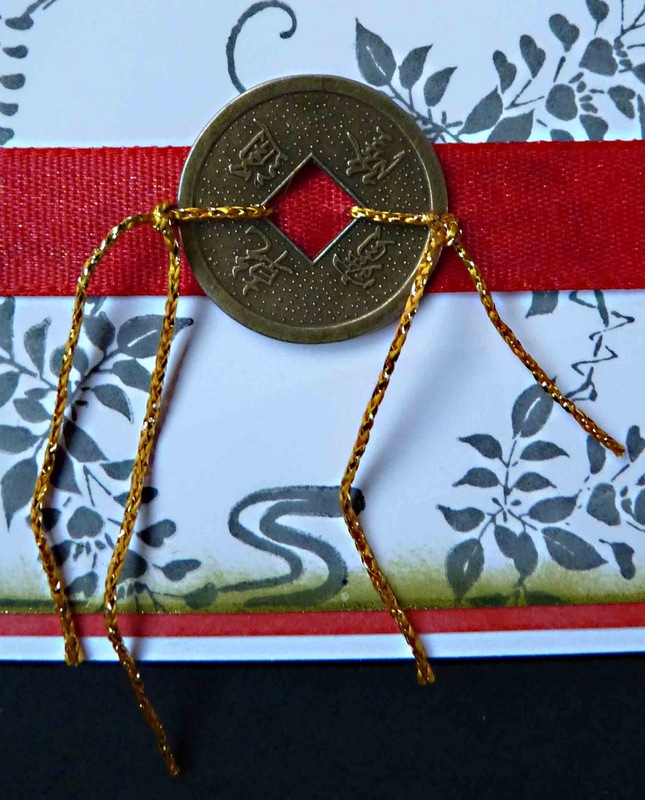 you succeeded in making your first oriental card turn into a beauty! Stunning card Brenda - thanks for joining in with Daring Cardmakers. 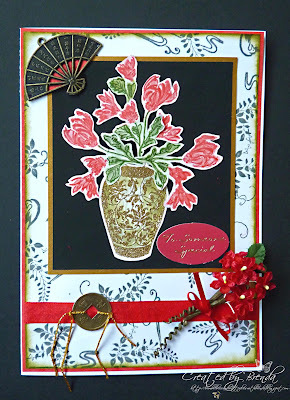 Great take on the oriental theme for Daring Card makers, the flowers and coin just finish off your card. Fabulous card! Thanks for joining us this week at Going Grey with Scrap-creations! I love the Asian flair on this wonderful card. What a beautiful job you did! Thanks for playing with us this week at Going Grey with Scrap-Creations and Good Luck!